WASHINGTON, DC, December 22, 2009 (ENS) – To address the water crisis in California, the Obama administration today released a coordinated interim action plan that involves six federal agencies. The plan is undertaken in accordance with a Memo of Understanding signed at the end of September by six federal agencies – the Departments of the Interior, Commerce, Agriculture and the Army as well as the U.S. EPA and the White House Council on Environmental Quality. The administration is giving priority attention to these issues because the Sacramento/San Joaquin River Delta-San Francisco Bay Estuary, commonly called the Bay-Delta, is among the most important estuary ecosystems in the nation, the administration says in its action plan. 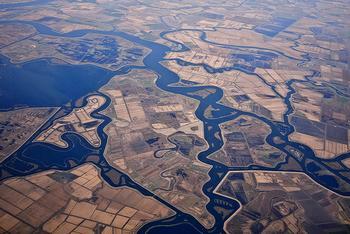 The Bay-Delta is the hub of the nation’s largest water delivery system, providing drinking water to 25 million Californians. The ecosystem sustains about $400 billion of annual economic activity, including a $28 billion agricultural industry and many recreational opportunities. But the Bay-Delta ecosystem is now in crisis. After decades of steep and steady decline, the ecosystem has reached a point of collapse, with some imperiled fish species at all-time low population levels and threats from climate change and associated sea-level rise, seismic risks, and other stressors – such as pesticides, pollutant discharges, and invasive species – underscoring the system’s vulnerability. For the past three years, California has suffered drought and the annual reservoir recharge has been only one-half to two-thirds of average. Now, water supply managers are facing a possible fourth dry year with low reservoir levels, and both agricultural and urban water customers are being asked to reduce water use yet again. The Bay-Delta is inhabited by 55 species of fish and 750 species of plants and wildlife. Until recently, it supported a thriving commercial and recreational fishing industry that normally contributes hundreds of millions of dollars annually to the California economy. Drought on top of decades of environmental degradation of the Bay-Delta have closed the commercial salmon fishery. State officials estimate that the fishery closure in 2009 caused the loss of 2,690 jobs and led to an economic loss of $279 million. The coordinated federal action plan announced today is intended to promote smarter water supply and use by constructing projects that increase flexibility in the water supply system; enhancing water transfers; and ensuring that the best science is applied to water supply decisions. The plan calls for intensifying and aligning federal water conservation efforts with those of the state. Federal agencies will be more involved in the Bay Delta Conservation Plan, an effort currently underway to address critical long-term water issues in California. “Everything we do will be done in close partnership with the state of California and will build upon the path-breaking legislation recently enacted by the state,” Secretary Salazar said. The Obama administration plans to advance ecosystem restoration projects, including near-term habitat projects in the Bay-Delta to accelerate the restoration and propagation of Delta smelt and other aquatic species and to address climate change impacts on the Bay-Delta. The plan calls for federal agencies to help deliver drought relief services and ensure integrated flood risk management, including the prioritization of projects and activities for flood risk management and related levee stabilization projects and navigation. At the same time, the National Research Council has begun a two-year review of the scientific basis of actions to achieve both an environmentally sustainable California Bay-Delta and a reliable water supply, at the request of Congress and the U.S. departments of the Interior and Commerce. To help shape near-term decisions and also provide an integrated, long-term view of water and environmental management in the Bay-Delta ecosystem, the Research Council will issue two reports. The first report will focus on scientific questions, assumptions, and conclusions that underlie water management options in the U.S. Fish and Wildlife Service’s Biological Opinion on coordinated operations of the Central Valley Project and State Water Project. The first report will also focus on the National Marine Fisheries Service’s Biological Opinion on the Long-Term Central Valley Project and State Water Project Operations Criteria and Plan. The committee will assess “reasonable and prudent alternatives” that would have less impact on other water uses compared with those in the biological opinions, and would provide equal or greater protection for the fish species and their designated critical habitat covered in these opinions. The committee will consider options that might avoid assisting one federally listed threatened or endangered species while negatively impacting another. In the fall of 2011, the committee will issue a second report on how to best incorporate science and adaptive management concepts into programs for the management and restoration of the Bay-Delta. The 15 member committee includes scientific experts in water-related specialties from around the country. It will be chaired by Dr. Robert Huggett, an independent consultant and professor emeritus and former chair of the Department of Environmental Sciences, Virginia Institute of Marine Sciences at the College of William and Mary, where he was on the faculty for over 20 years. He is an expert in aquatic biogeochemistry and ecosystem management. The committee’s first meeting, which will include public comment sessions, is scheduled for January 24-28 at the University of California, Davis.